Jennifer Lopez stormed through a 60th anniversary tribute to Motown at the Grammy Awards on Sunday. Flaunting her dancer’s figure in a glittering bodysuit, she blew through a series of dizzying moves with reliable showmanship. 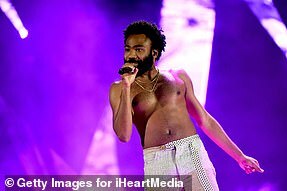 The 49-year-old’s gig attracted online backlash before it occurred, owing to the fact that she is not black and was never signed with Motown. She was defended by Motown icon Smokey Robinson, who slipped into a snappy scarlet and black suit and joined her onstage for the tribute. ‘Motown was music for everybody. 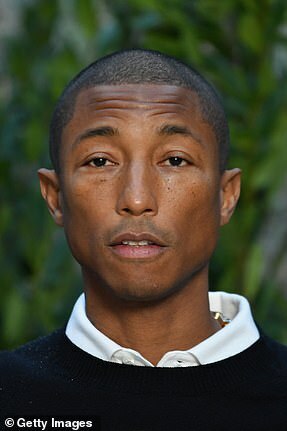 Everybody,’ said the Since I Lost My Baby and The Way You Do The Things You Do songwriter. 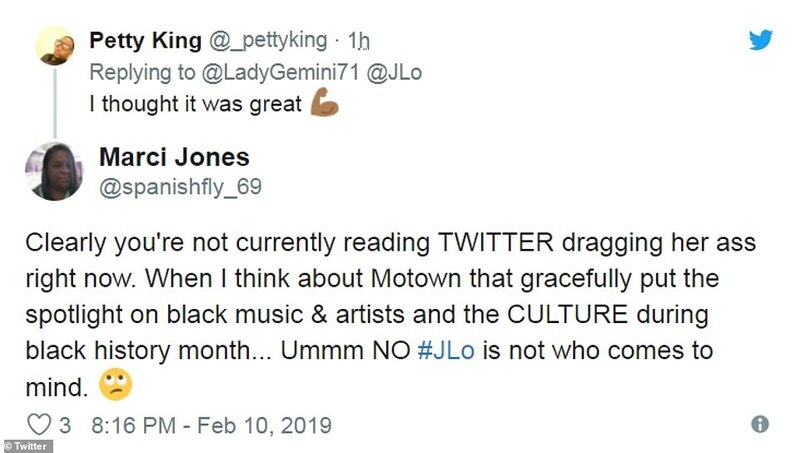 ‘Who’s stupid enough to protest Jennifer Lopez doing anything for Motown?’ said the record label’s former vice president, noting her upbringing ‘in her Hispanic neighborhood’ with regard to the question of authenticity. 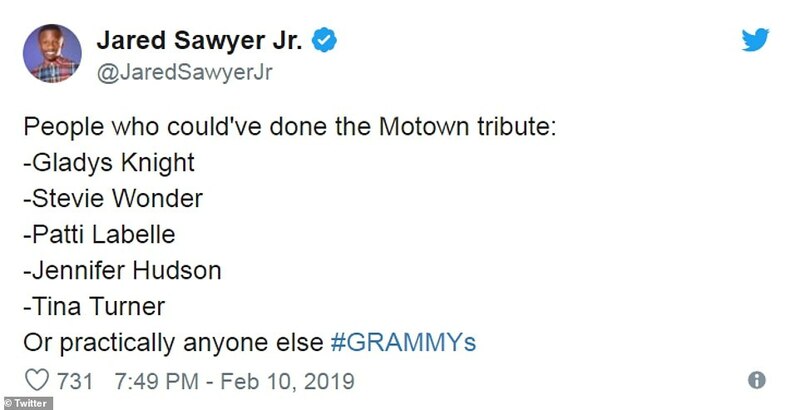 Still more affirmation came from Motown founder Berry Gordy, who could be seen smiling in evident enjoyment in the audience. Jenny From The Block also shared the stage during her medley with the evening’s compere Alicia Keys for Papa Was A Rollin’ Stone, War and Square Biz. 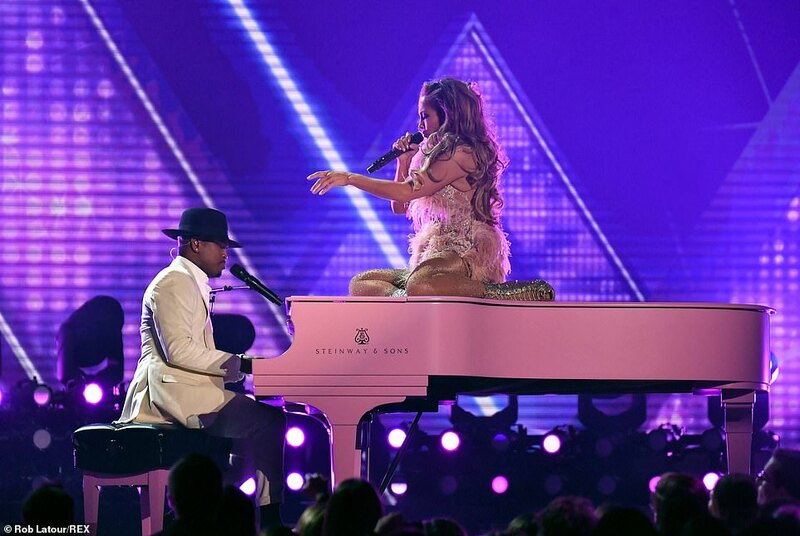 As the tribute wore on, Jennifer leaped up onto a pink piano and lay on her back, singing up a storm as Ne-Yo accompanied her at the keys for Another Star. 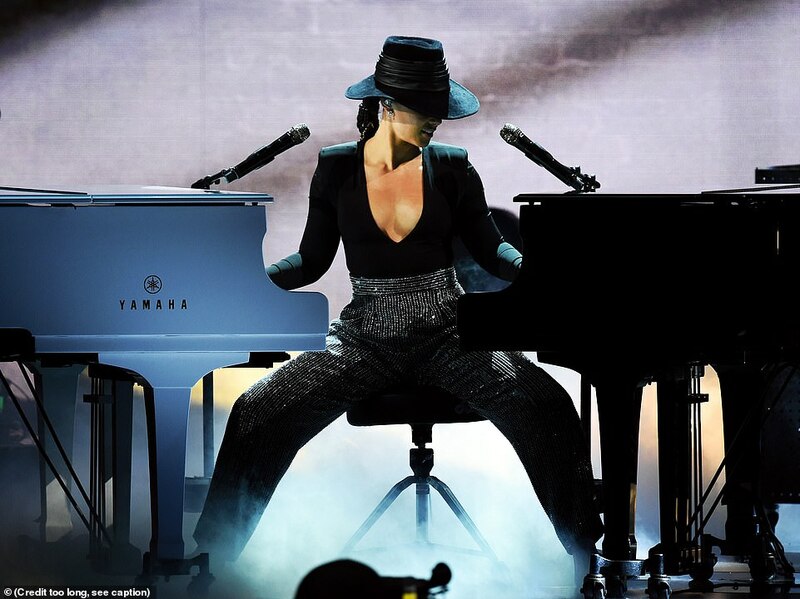 She writhed enthusiastically on top of the Steinway as Ne-Yo played in front of her, cutting a dapper figure in a white suit and a black top hat. 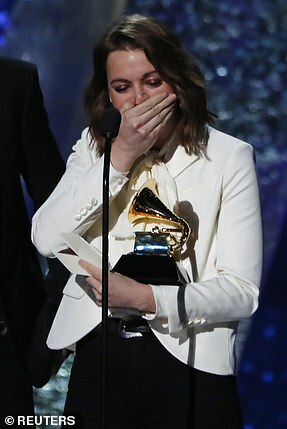 Her lineup that night included such Motown hits as Do You Love Me?, Please Mr. Postman, Dancing In The Street and The Best Things In Life Are Free. As well as her marquee colleagues, Jennifer was joined by a fleet of backup performers for the Latin-influenced dance sequences. 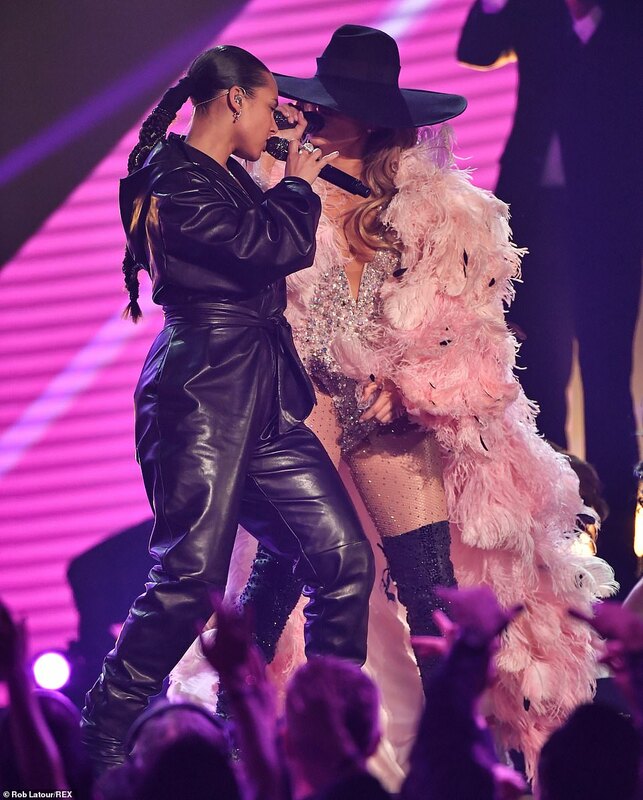 J-Lo brought back the recording company’s iconic sense of chic, blowing through a string of throwback ensembles during her energetic performance. One of these was a flowing black sequined wrap with powder pink feathery lining – which she eventually tore off to reveal a skimpier bodysuit underneath. Papa Was A Rollin’ Stone began as a May 1972 single for The Undisputed Truth but gained legendary status as a smash by The Temptations that September. Inversely, War began life as a number for The Temptations but wound up in the hands of Edwin Starr, who made it a massive hit. Teena Marie sang Square Biz in 1981 on her fourth studio album It Must Be Magic, the last LP she released with Motown before moving to Epic. Berry wrote Do You Love Me? for The Contours in 1964, while Stevie Wonder penned and performed Another Star a little over a decade later. The Marvelettes introduced Please Mr. Postman to the world in 1961, three years before Martha And The Vandellas cut their record of Dancing In The Street. The Temptations went on TV in 1968 and sang The Best Things In Life Are Free, and standard from the 1927 college football-themed Broadway musical Good News. 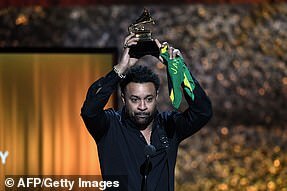 Diana Ross, who shot to fame as part of Motown’s prized girl group The Supremes, also took the stage at Sunday’s Grammys for a medley of her hits. Earlier that day, Jennifer cut an eye-popping figure on the red carpet, modeling a jewel-encrusted gown and a massive hat pulled extraordinarily far down. The Bronx-born Monster-In-Law star, whose new film Second Act bowed a couple of months ago, attended the red carpet on the arm of her former New York Yankee boyfriend Alex Rodriguez. 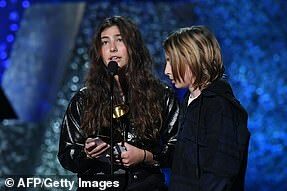 While milling around the red carpet, she posed up a storm alongside her fellow pop diva Lady Gaga, who won three Grammy Awards that evening courtesy her songs Shallow and Joanne. 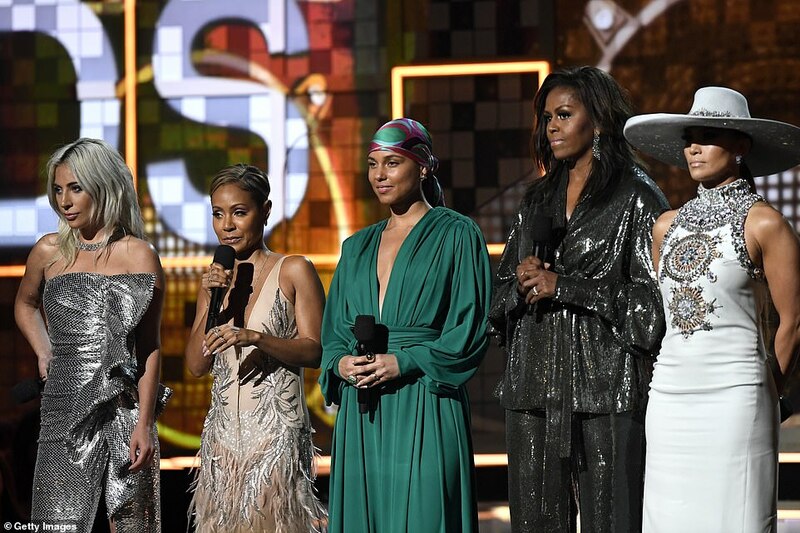 Near that beginning of the awards show, Jennifer hit the stage with Alicia, Gaga, Jada Pinkett Smith and former United States First Lady Michelle Obama to pay tribute to music and women. 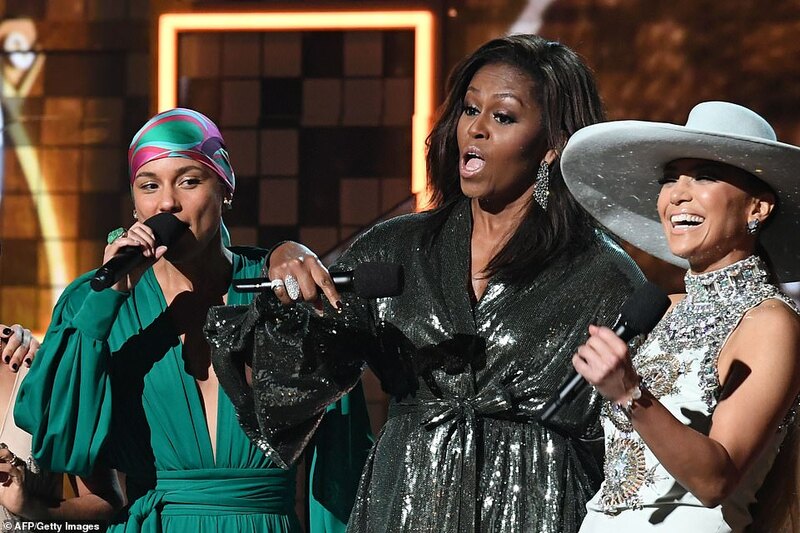 Michelle earned a rapturous response from the live audience as she delivered her speech, during which she gave a nod to ‘the Motown records I wore out from the southside’ of Chicago. The award show was opened by an energetic performance by Camila Cabello, who pranced around the stage for a bilingual extravaganza with J Blavin and iconic pop hunk Ricky Martin. 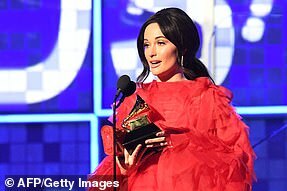 Dolly Parton participated in a tribute to herself that featured her goddaughter Miley Cyrus – as well as album of the year winner Kacey Musgraves, plus Katy Perry, Jimi Westbrook and Kimberly Schlapman. 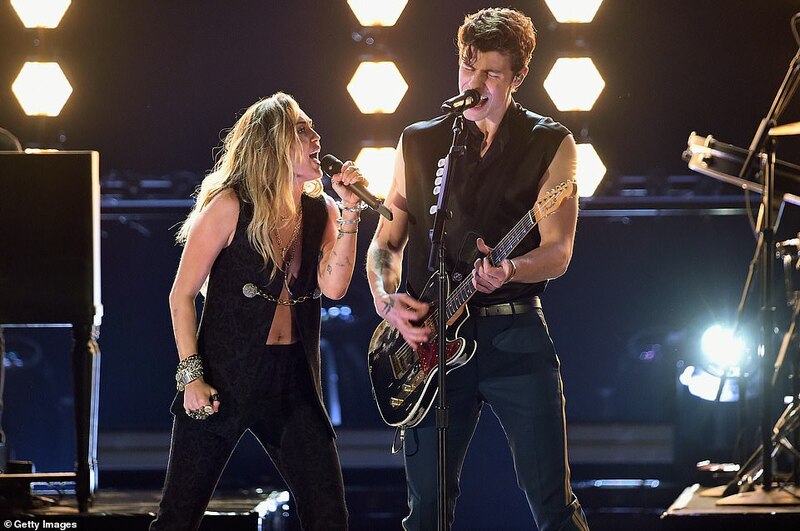 Miley had also taken the stage that evening with none other than Shawn Mendes, the pair of them wearing matching sleeveless black tops while belting his ditty In My Blood. 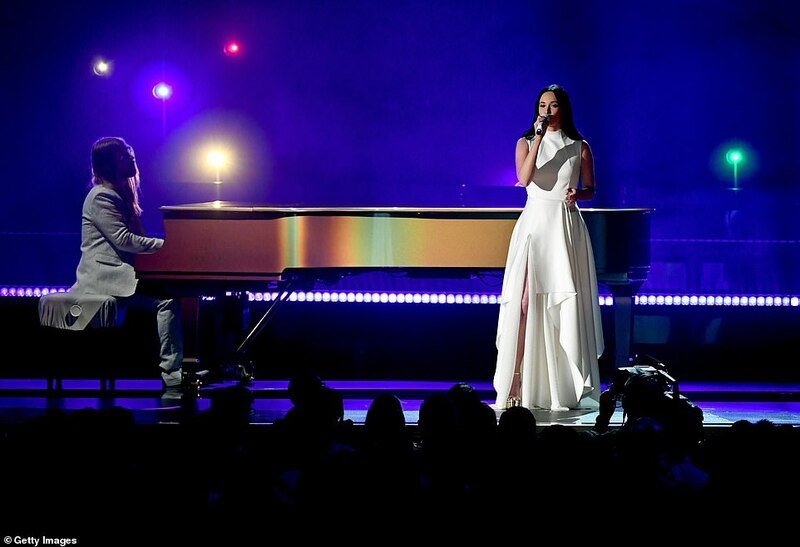 Kacey was a multiple-time performer that night as well, cutting a simply elegant figure in a white dress and standing solo in front of the microphone to croon her number Rainbow. 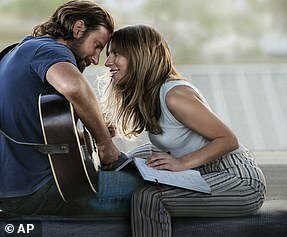 Lady Gaga evoked 1970s chic, letting her platinum blonde hair fly free and slipping into a sparkly skintight jumpsuit, for a rendition of her Grammy-winning song Shallow from her new A Star Is Born remake. 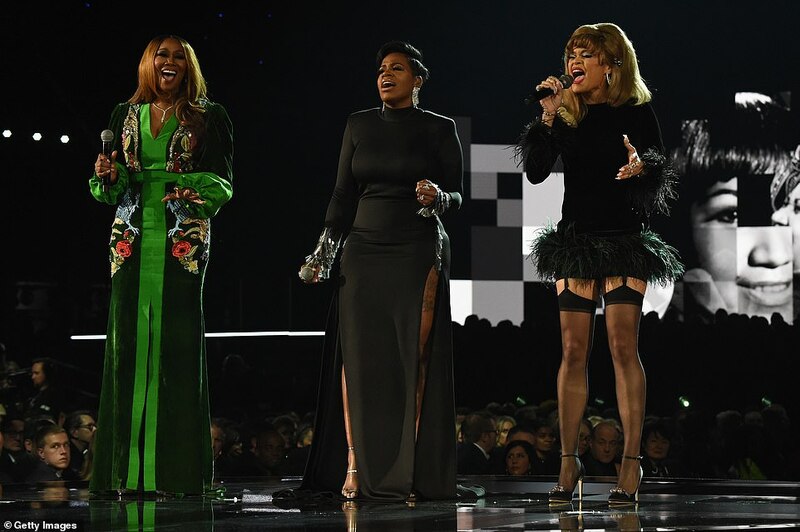 At the end of the in memoriam real, Fantasia got together with Yolanda Adams and Andra Day for a showstopping take on the late Aretha Franklin’s song (You Make Me Feel Like) A Natural Woman. Cardi B slid into a glittery jumpsuit with a spray of feathers, rather resembling a peacock as she electrified the audience with a performance of her song Money. 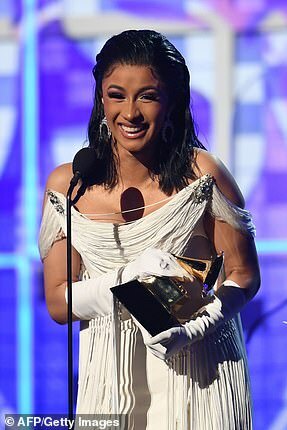 That evening, Cardi took home the best rap album gong for her debut LP Invasion Of Her Privacy, becoming the first woman ever to win in that category. 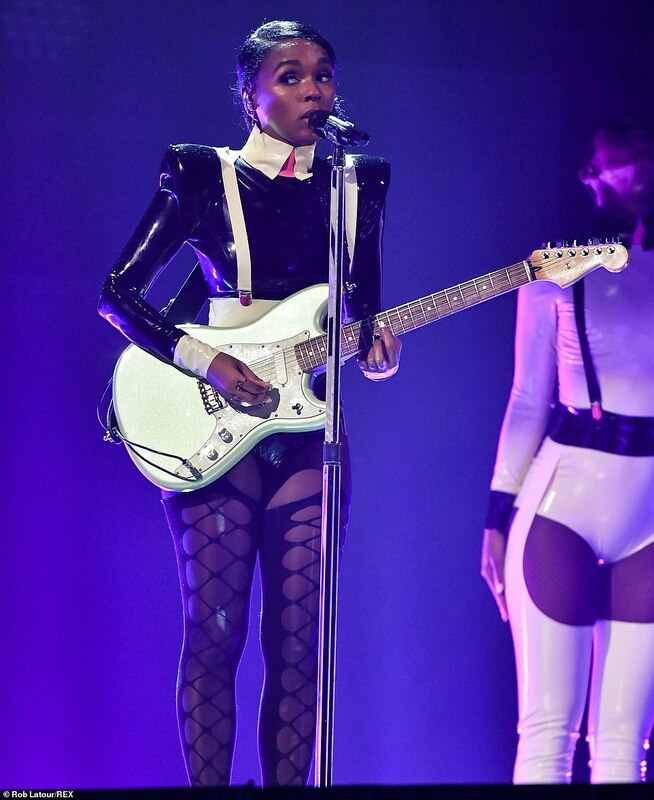 Janelle Monae once again demonstrated her musical talent and fashion acuity when she rocked a gleaming monochrome bodysuit with a high collar and accompanied herself on the guitar for her song Make Me Feel. 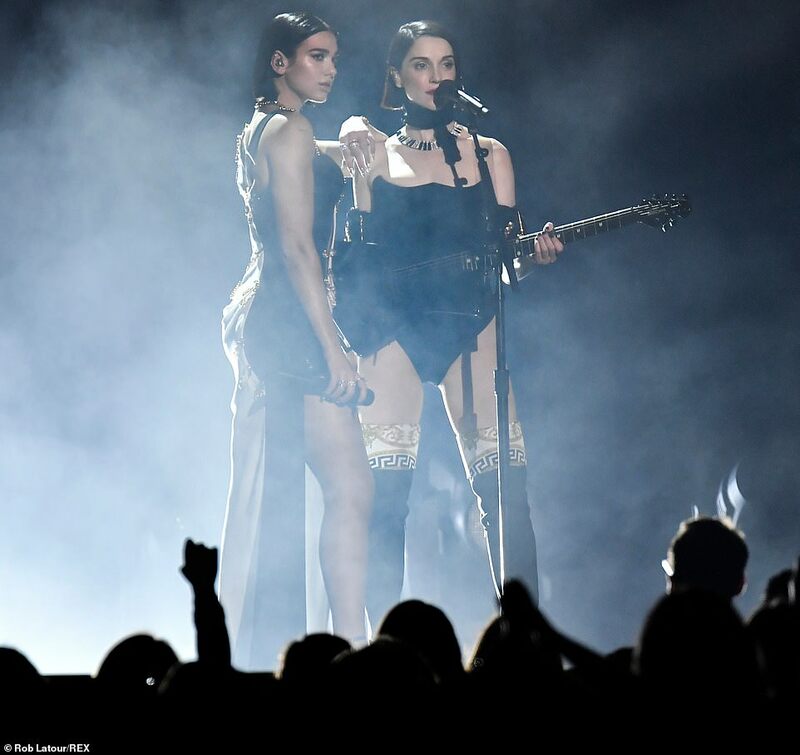 St. Vincent and best new artist winner Dua Lipa banded together and sizzled onstage for the former’s song Masseduction and the latter’s number One Kiss. 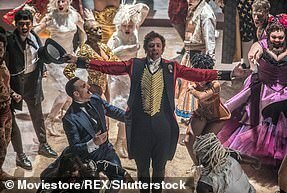 Alicia displayed the virtuoso stagecraft that helped get her the hostessing gig, playing two pianos at once during a medley that ranged from the old standard Unforgettable to the Coldplay song Clocks to her smash New York. 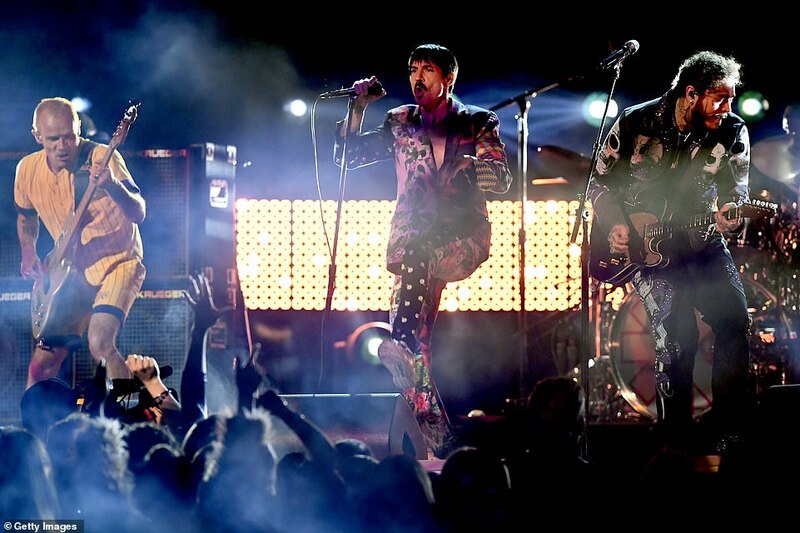 Post Malone got onstage and gave the audience his song Stay before he and the Red Hot Chili Peppers teamed up and resuscitated that band’s 2016 song Dark Necessities. 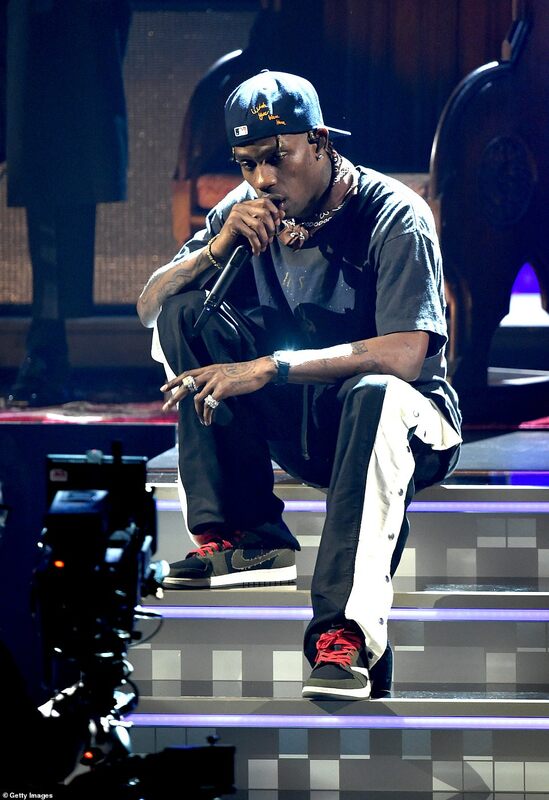 Travis Scott, who famously has a one-year-old daughter called Stormi with Kylie Jenner, got a bit of help from James Blake on his performance, which included Stop Trying To Be God and No Bystanders.